We believe that speaking your own story is a fundamental human need, and that every child is a storyteller. 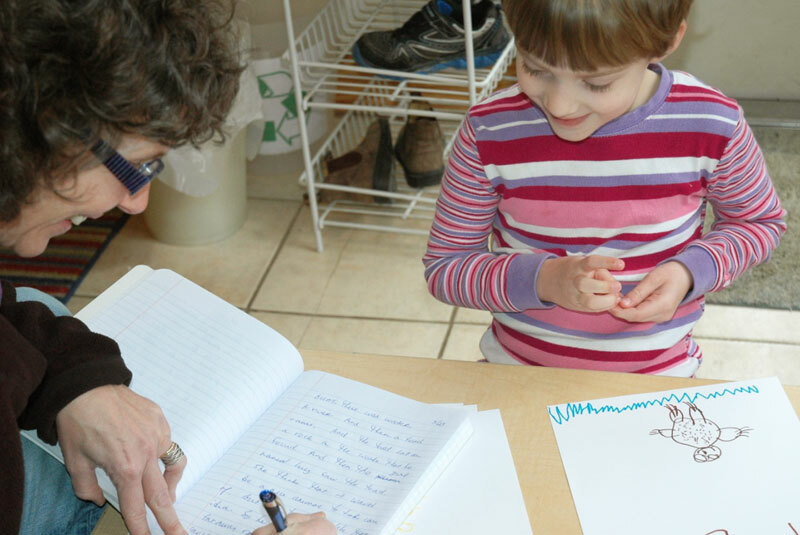 In a practice adapted from the work of Vivian Paley, Children Firsters speak their stories to a teacher, who writes them down, reads them back, and then helps the child turn the story into a play that is acted by the whole group. This work has much value. It helps children connect spoken and written language. It bridges pretend play, the primary business of early childhood, with literacy. 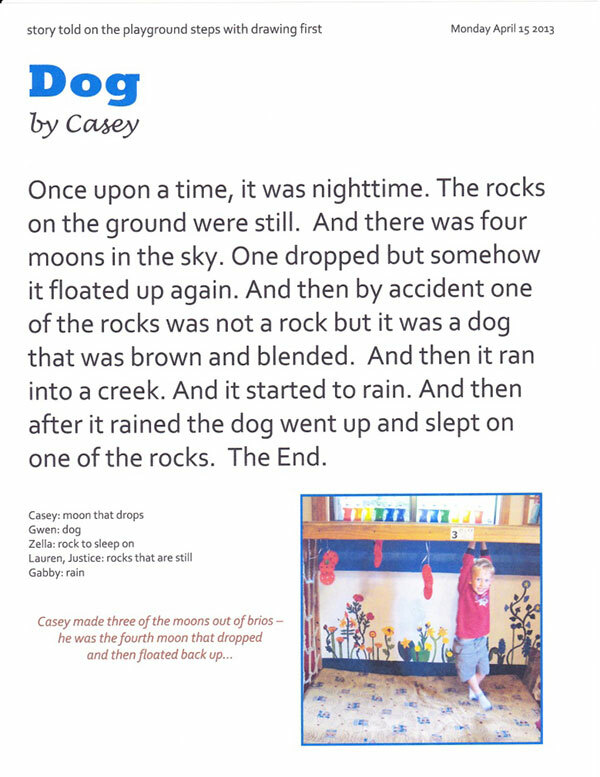 It allows children to integrate and create with what they are learning about language and story when they listen to adults tell stories and read books aloud. It helps children connect with each other in deep and meaningful ways; they come to know each other’s inner lives through the stories they hear each other tell. And acting the stories — working together to make these inner landscapes visible and recognized and shared — helps make us a community. Izzy has her backpack on and Mommy has the baby carrier in her hand. And Theo is in the baby carrier. And they are driving to school. They were driving to school and suddenly a green bus comes and a green alien came and said, “Let’s go to school!” They said, “Alien, we’re going to school but which school are you going to?” “We’re going to Kira and Tessa’s school.” and then Izzy says, “I don’t go to that school.” “What school are you going to after that?” “Children First.” “Then I will go in that bus,” said Izzy. And then they got to Children First, Donna and Khristine said, “Who do you have with you today, Izzy?” “Green alien” said Izzy. And then everyone laughed. And then the alien played with Izzy and all her friends. The End. Once upon a time there were little kids in their house. And then they went out of their house. And soon as they went out of their house a monster came. And then they tape all the doors and all the windows before the monster got to their house. And after they got in there, the monster was there and he had a secret way to get in. He broke the house with his pointing fingernails, then he found the kids and they ran away as quick as they can. And then they hided in the restaurant where they could get food because they’re hungry. Then the monster went past where they were. Then the monster couldn’t find them. Stories… don’t have to be from movies, they can be your own thing, your own thing, anything that you want. Long or short. Scary or not. Peaceful or not. Loveable or not. Anyway is possible.